There has been a steady decline in number of health care infrastructure crucial for first level of intervention, according to the Economic Survey of Delhi 2017-18. For example, maternity homes and sub-centres saw a dip from 284 to 193 between 2007 and 2016. Number of primary health centres has remained stagnant at 8. This is despite the fact that the State’s population has been increasing at the rate of 10 per cent every five years. Even more surprising is the fact that the number of dispensaries in the state has reduced by 17 per cent in just one year: from 1507 in 2015 to 1240 in 2016. It is worth noting that although the number of nursing homes has almost doubled from 607 to 1057 between 2007 and 2016, number of hospitals dwindled from 94 in 2012 to 83 in 2016. The reasons, according to the survey document, are non-availability of land, shortage of manpower and multiplicity of agencies. 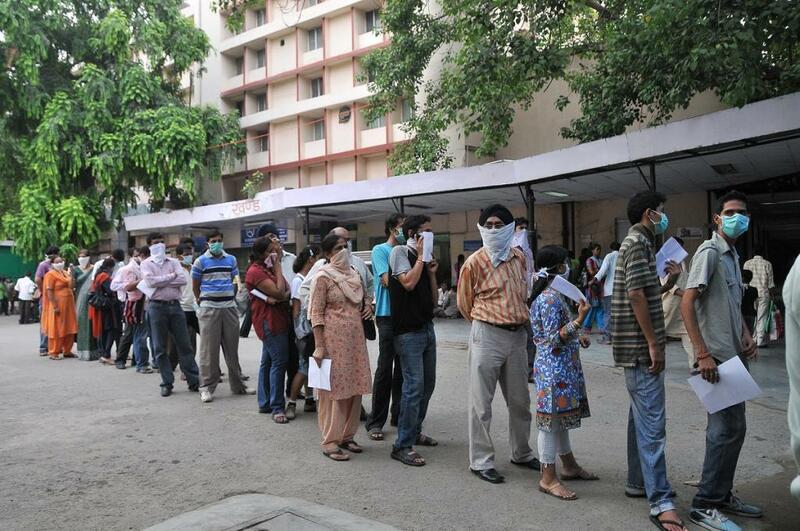 The immediate fallout of this is that the hospitals in Delhi are facing heavy patient load. According to the recommendations of the World Health Organization (WHO), bed to population ratio should be five per thousand people. However, the bed to population ratio in Delhi till 2015-16 has remained at 2.86—almost half the prescribed level. At the end of year 2016-17, total bed capacity in Delhi was 53,329. The survey suggests that out of the total beds available in medical institutions across the city state, private nursing homes, private hospitals and voluntary organisations contribute 50.28 per cent. On the other hand, medical institutions operated by government of India, Delhi government and local bodies offer 20.90 per cent, 20.45 per cent and 8.1 per cent of total beds respectively. “Delhi has also showed the highest private sector participation in health sector,” observes the Economic Survey. The government investment in health sector increased significantly from Rs 861.66 crore in 2007-08 to Rs 2,095.36 crore in 2016-17. The per capita expenditure by the Delhi government increased by 44 per cent—from Rs 1,547.55 to Rs 2,232.82—between 2011-12 and 2015-16. While the survey expresses concern over loss of productive days due to cases of dengue, malaria and chikungunya in the national capital, it stated that “adequate publicity, safeguards for preventing growth of mosquitoes are carried out by DHS and local bodies” to counter the menace of dengue, malaria and Chikungunya. Despite that, according to the data from National Vector-borne Disease Control Programme, Delhi witnessed 9,232 dengue cases in 2017—the highest in the last seven years. In a positive development, the state has been able to bring down the death rate due to tuberculosis at the lowest level—3 per cent as opposed to 4 per cent nationally for new infected patients. Moreover, infant mortality rate and under-five mortality rate are at 18 and 22 per thousand, as opposed to the national level of 34 and 39 per thousand.